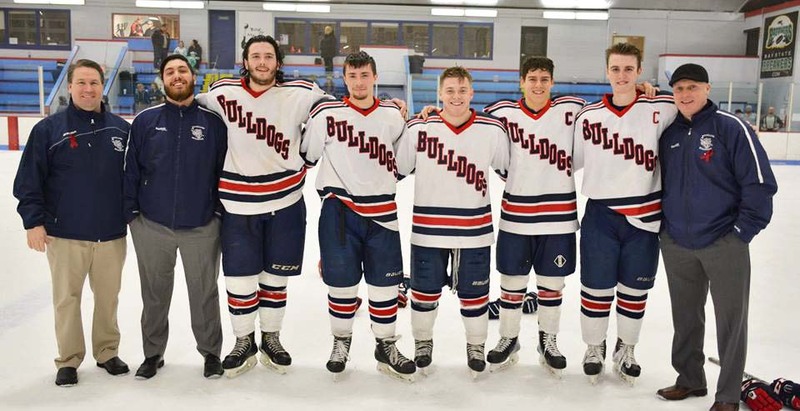 The hockey team had its best start for a hockey team in Rockland High School history, and from there went on to capture their first South Shore League title since 1991 on Sunday the 29th of January. In the 1990-91 season they were co-champs with Hanover. They were league champions by themselves in the 1985-86 season. Everybody expected the Bulldogs to be good this year, but not many people expected them to only have one loss this deep into the season. It was was a close race to finish at the top of the South Shore League between Rockland, Cohasset, and Norwell, but the Bulldogs clinched it with a 3-2 win over Hull/ Middleboro. At the beginning of the year coach Mike Flaherty had three goals for his team to accomplish: to qualify for the MIAA tournament for the 9th straight season, to not lose a game at home, and to win the South Shore League. As the season has progressed, they have accomplished two out of the three. They have already qualified for the tournament, and they’ve won the league. Unfortunately the Bulldogs failed to complete their third goal with a tough loss at home against Norwell on Saturday, Feb. 4. With only a couple games left in the regular season, and only having one loss the Bulldogs are hoping for a trip to the TD Garden in a State Championship game. If they keep up the form they are in there could be a good possibility of this happening. Asked who he would consider the team’s unsung hero, it wasn’t just one that Coach Flaherty gave credit to. He named his entire defense which consists of Chris McHugh, Dan McHugh, Brian McCullough, Tim Kane, Jake Lauria, and in the net, Harry O’Brien. With these opponents they will be playing against good competition and this will prepare them for the postseason that will begin after February vacation.